We’re excited to be able to introduce this new 20-page, informative resource that leverages our 15-plus years of experience in the fulfillment industry. 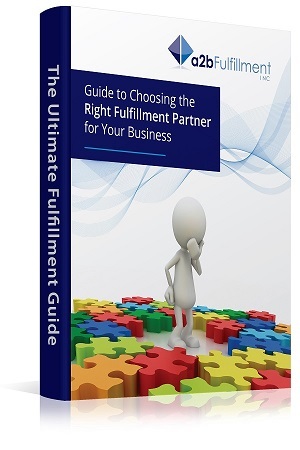 This guide is a terrific resource to help you better understand the fulfillment process; as well as lead businesses down the path to selecting the best order fulfillment partner that suits their needs. Our new fulfillment e-book outlines the typical services you can expect from fulfillment providers and a few important points and questions to ask as you talk to potential providers. As we have stressed in previous posts about why speed matters, you must reach your customers quickly in today’s economy. Learn a few strategies in selecting the geographic location of your business’ logistics operation. As precious as today’s customer journey has become, many businesses are choosing to wrap Customer Service in with their Fulfillment Plan. Our e-book highlights a few of the benefits in choosing to do just that. 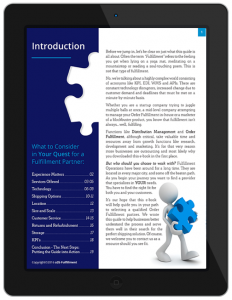 Click the Tablet to Preview a Chapter From The Ultimate Fulfillment Guide! 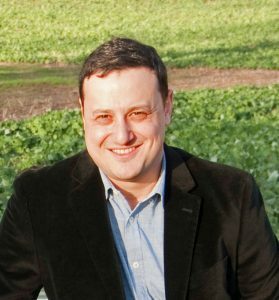 Ayal Latz is the Founder and President of a2b Fulfillment, a member of the International Warehousing Association and is a regular contributor to several industry trade publications, including Electronic Retailer, Response Magazine, Internet Retailer, Parcel and more.